This device installs between the anesthesia machine and the vacuum evacuation system. It equalizes both positive and negative pressure such that no metabolic gases are pulled past the patient. 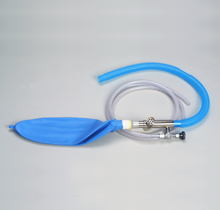 Includes: 3L reservoir bag, 6 each of 1/4" ID suction hose and 19mm evacuation tubing.
" Workers should not be exposed to an eight hour time-weighted average of > 2 ppm halogenated agents." " Removal of excess anesthetic gases from the anesthesia circuit can be accomplished by either active or passive scavenging. � When a vacuum or source of negative pressure is connected to the scavenging interface, the system is described as active. � When a vacuum or negative pressure is not used, the system is described as passive. 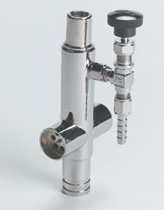 The scavenging interface serves to prevent potentially dangerous increases or decreases of pressure in the anesthetic waste gas disposal system from reaching the patient's breathing circuit. To do this, the interface has three components: positive pressure relief, negative pressure relief, and a reservoir. Regardless of the type of disposal system used (i.e., active or passive), positive pressure relief must be provided to protect the equipment and patient if occlusion of the scavenging system outlet occurs. If the scavenging system outlet becomes occluded, the positive-pressure relief vent opens to prevent transmission of high pressure to the breathing circuit. If an active disposal system is used, negative pressure relief is needed to prevent negative pressure (suction) generated by the disposal system from reaching the patient's breathing circuit. A reservoir is necessary to allow the scavenging system to accommodate an increased volume of excess anesthetic gas, which may transiently exceed the per-minute removal capacity of the system. It may also serve as a monitor of the scavenging system if the reservoir is a distensible bag. Overdistension of the bag could indicate inadequate function of the system and the need to adjust the needle valve to allow more gas to flow through."